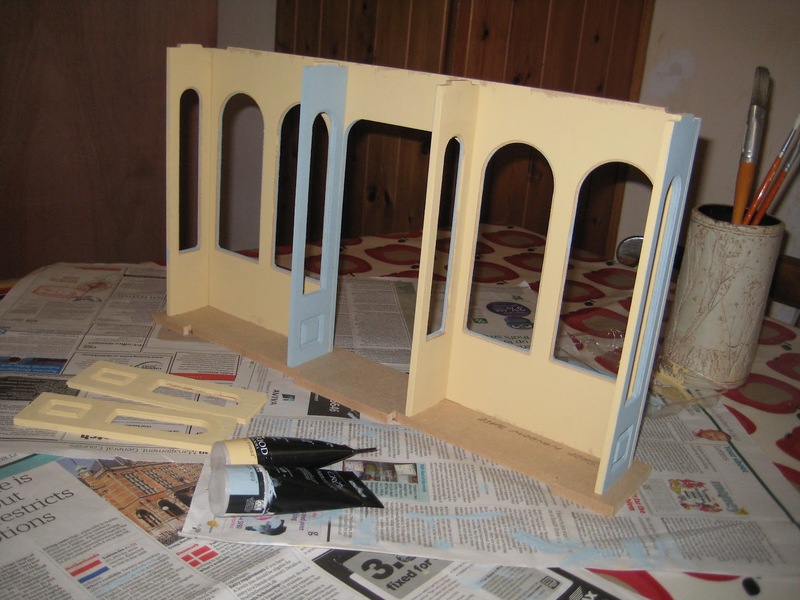 Following all that dutiful surface preparation with wood primer and dilute PVA, this week I decided to treat myself to a touch of colour! 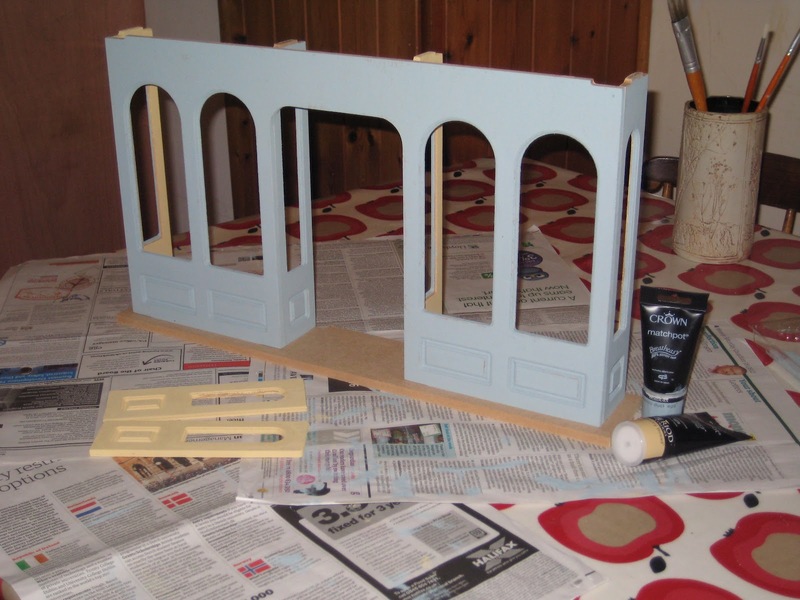 I hadn't done the shop front, so I primed the MDF section using handy 40 ml tester tubes of the paint I've chosen for the shop's top coat. Straight away, 'Chas. P. Brennan & Son' began to take on the tired post-war look that I'm after. The matt duck egg blue serves two purposes. First, it can easily be made to look faded and distressed. And second, before Charlie Brennan converted the place into an antique/curio shop in the early 1930s, it had been the Bluebell Tea Rooms (note the ambitious plural) and he hasn't bothered to change the colour since. The cream interior might even date from the same era but it's hard to say because the purest white paint soon yellowed in those days, especially with the help of coal fires and nicotine. Of course, this coat is only the primer so I have still got to work on all those fiddly mouldings and rebates. I guess sharply folded sandpaper may be the best thing to use. I promised I would show you some items from my collection built up over the years. I have to say there's been no rigid plan behind these purchases, other than the timeline 'England 1948', which means anything suitable of that date or earlier. The bed is a Roberson but I'm afraid I don't recall the maker of the dainty feathered hat hanging on the bed knob. If you happen to recognize it, I'd love to know, it was one of my first purchases. The wonderful Fair Isle pullover was a commission hand-knitted by Isobel Hockey. 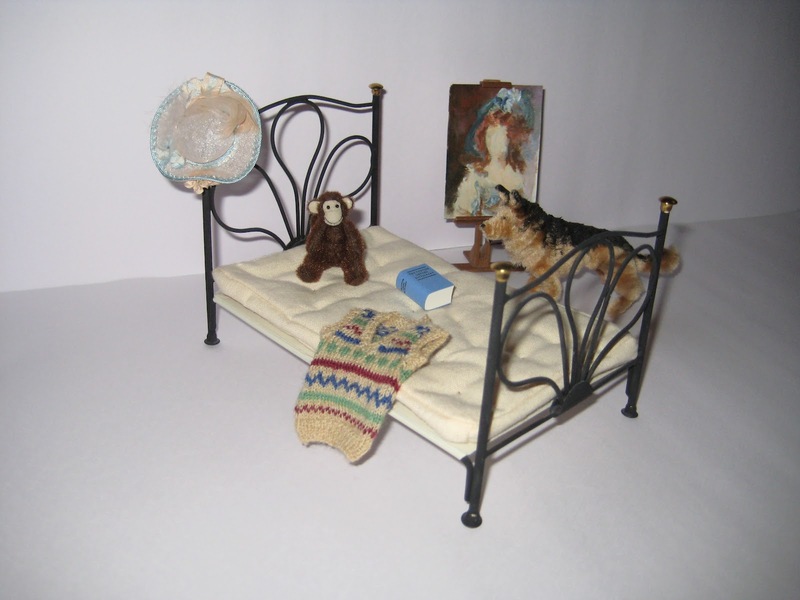 The equally wonderful fully-jointed toy monkey was also a commission, made by Moira Carter. The 'pipecleaner' dog is one of Judi Noakes's Petite Pets. His name is Rex and he belongs to Charlie's son Frankie. The dog is a German Shepherd although back then he'd be called an Alsatian. Frankie's in charge of everything outside in the yard and Rex keeps guard over it for him. Behind the dog is an artist's easel, accurate to the last tiny screw and nut. Somehow, once again I have no note of the maker. The work-in-progress however is my mother's, who also supplied me with several finished framed paintings that I'll put up another day. Finally, the Oxford Dictionary on the bed is from the stock that I used to sell myself. Charlie is a keen crossword puzzler, so it's always close at hand together with the morning paper and a big mug of tea.